On this page, I will share with you all the different crafty things I’ve attempted (the good and the bad…often very bad!) and you can either have a go yourselves, get some ideas and inspiration or just laugh at me and thank your lucky stars you aren’t married to me! How the hell did I do it?! 1) Take your piece of wood and clean it up as you see fit. Luckily my piece of driftwood was in pretty good order and just needed a little brush over. 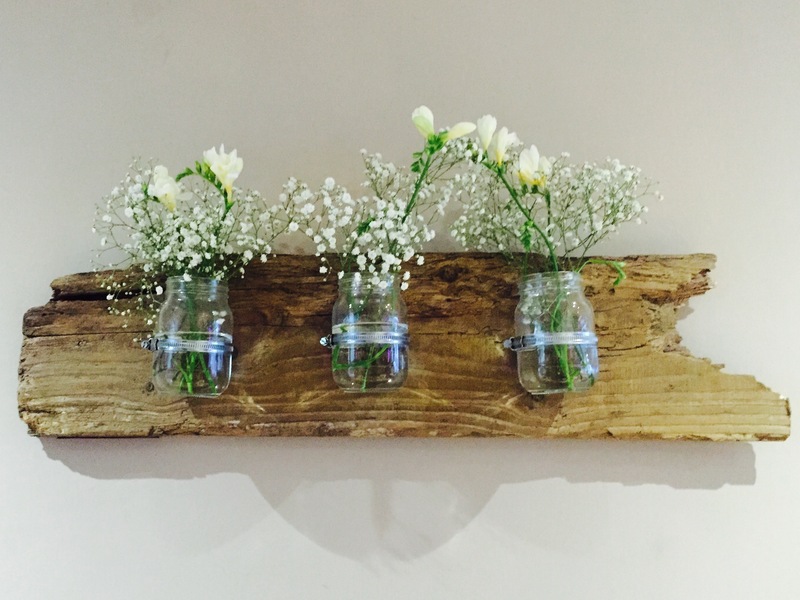 2) Decide if you’re hanging your driftwood Kilner jar vases on the wall. If you are, fix some picture hanging brackets on the back of your driftwood so it’s ready to be hung on the wall at the end. 3) On the front of your driftwood, measure and mark the Centre point using your tape measure. This will be where you place your first Kilner jar. Then measure from the left hand edge to the Centre point to get the middle of the 1st section, and then again from the right hand edge to the Centre to get the 3rd section. Now you have the positions for your 3 Kilner jars marked. 4) Take your hose clips and position one on the workbench. Use the punch tool and the hammer to drive a hole into the hose clip where the Centre point is as you rest the clip on the workbench (so the screw of the hose clip is on the left hand side and the nail can go through the back of the clip and then into the driftwood). Repeat this for the other 2 hose clips. 5) Take your hose clips, now with the holes punched in, and find your 3 nails. Lay the driftwood down on your workbench with the ‘show side’ facing you. Using the hammer, hold the hose clip in place as you bang a nail in through the clip and into the driftwood to secure it in place. Repeat this step for the next 2 hose clips. 6) Now all your hose clips are in place, just slide you Kilner jars into the clips and tighten them using the large screw to the left of the clip, using a screwdriver. Your Kilner jars will now be fastened securely into the clips and you can straighten them up by sight once you’ve got all the jars in place. 8) Now stand back, marvel at what you have made, go have a Gin and question why on earth you decided to have a go at it…bloody Pinterest. Always makes stuff look so easy! I made these to go on a chalkboard wall in our new kitchen/diner. Strong craft glue, not Pritt Stick! A sharp pencil (if hanging on the wall, ignore this if not). 2) Open the paint and give it a stir. 4) Leave to dry, preferably overnight and there you go! 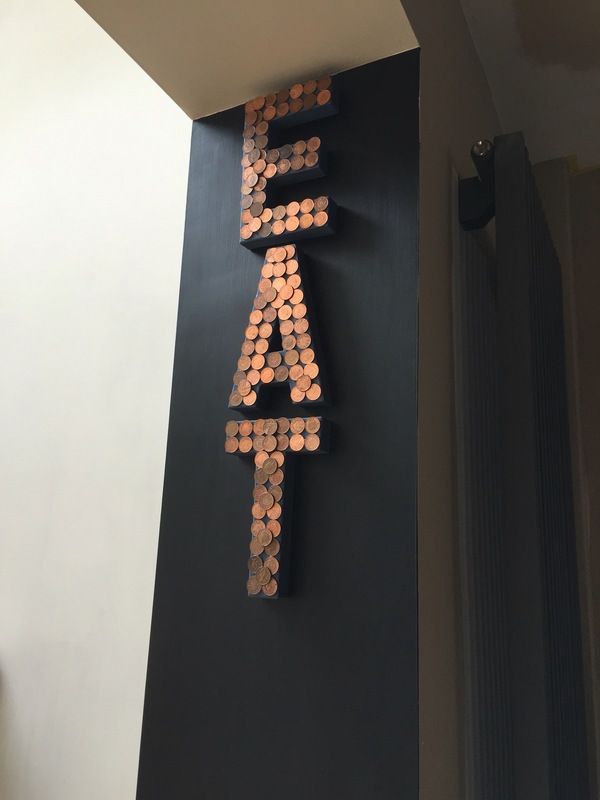 Some copper coin covered letters! 5) If you want to hang the letters on the wall, make a hole in the back of the letter using a sharp pencil or a screwdriver and then hang on the wall using a picture hook or a nail. They look just as good stood on a windowsill, shelf or table. IDEAS: If you wanted to do them slightly differently, for a kids bedroom say, you could tear up the pages of a magazine and stick that on the letters (put glue on the letter, stick paper on and leave to dry and then seal with more glue over the top). I’ve seen some marvel comic ones which looked great but any favourite characters of theirs would go down well. A little something I made for the garden using an old pallet we had left over once our building work had finished. I change what I put in the pots, sometimes salad and herbs, sometimes plants, and it requires watering even in winter to keep it looking as good as new. It depends on which pallet you have got in your posession but to make this, all I had to do was remove 3 slats of wood off the top of the pallet to make the shelves. I did this by using the underneath of the pallet as the front and I then nailed the planks onto the existing framework. I watered down some exterior paint and gave it a soak with that to get the light grey colour. Once dry, I then painted a little patch with some chalkboard paint so I could write on it. Super simple to make and a bit of a feature in the garden year round. I love it.